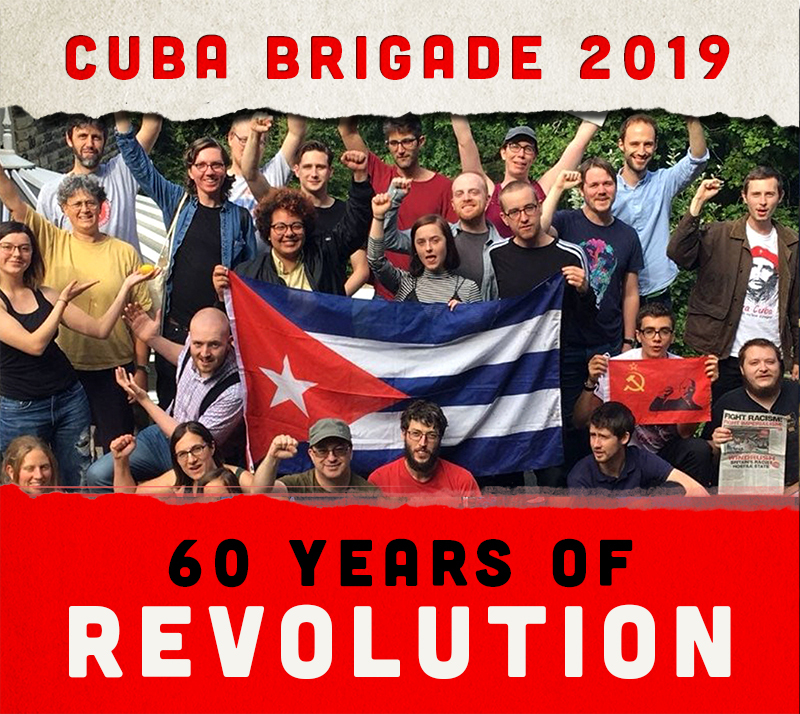 In December 2015, Rock around the Blockade (RATB) celebrates the 20th anniversary of its first solidarity brigade to Cuba. RATB was set up by the Revolutionary Communist Group (RCG) in 1995 to support socialist Cuba. Active solidarity with Cuba has distinguished the RCG from the majority of the British ‘left’, enabling it to raise ‘socialism’ as a viable alternative to capitalism and imperialism and move beyond idealistic sloganeering, to introduce real questions of relations of production, power and democracy. After five years of austerity and with further savage cuts to benefits and public services on the way the need to present a socialist alternative is greater than ever. Helen Yaffe reports. The first RATB brigade travelled to Cuba with over 30 brigadistas in December 1995 in the midst of Cuba’s ‘Special Period’. The Special Period began in 1991 with the severe economic crisis following the disintegration of the socialist bloc and consequent collapse in Cuba’s foreign trade. By 1993 Cuba’s international trade and gross investment had fallen by 80% and GDP had plummeted by 35%. Cuba’s crisis was exacerbated by punitive US laws tightening the blockade. The result was critical scarcities of hydrocarbon energy resources, fertilisers, food imports, medicines, cement, equipment and other resources in every sector. Calorific intake decreased by nearly 40%, industries closed and unemployment rose. The impact of the economic crisis was obvious during the brigade. We stayed in a large agricultural camp in Ciego de Ávila in central Cuba. Conditions were austere. We got woken up at 5am with rock music blasted top volume over the dormitories to work in the banana plantation. On other days we visited schools, hospitals, cultural centres – all remarkable, but almost completely lacking resources. In one school we visited, the director showed us a writing book – the only one they had to supply all the children for the coming term. Our bus broke down frequently, petrol was scarce; spare parts did not exist and had to be invented. We shared the camp with 300 young people who had volunteered to labour on the land, determined that their Revolution would survive the crisis. Of course, many thousands of Cubans gave up: leaving the island or opting out of the collective. What is more interesting is understanding how and why the Revolution retained the commitment of the majority of Cuba’s population. Since 1995, RATB has organised 12 further solidarity brigades – all, like the first, organised through Cuba’s Union of Young Communists (UJC). We organised two speaking tours of Cubans in Britain: in 2002 (with two women, leading members of the UJC) and in 2008 (with Orlando Borrego, who in the 1960s was deputy to Che Guevara in Cuban industry, plus two other representatives from different generations). We have produced a documentary, Cuba: defending socialism, resisting imperialism, and many short clips and interviews, available on our Youtube channel: ‘CubaVive’. Our regular newsletter was replaced by a website (ratb.org.uk) carrying news from Cuba and Latin America. We have developed excellent relationships with the Communist Party of Cuba, the UJC and with Cubans in many sectors. We have extended the focus of work to solidarity with revolutionary Latin America, supporting the Bolivarian Revolution in Venezuela and the progressive governments and movements in Bolivia, Ecuador and elsewhere. The emergence of progressive governments and movements in Latin America has been important for Cuba, opening up space for manoeuvre in economic, political and social terms. Over two decades, we have analysed developments within Cuba and in Cuba’s international relationships. Our educational work has contributed to breaking the information blockade of Cuba: the censorship which hides Cuba’s achievements and lies about life in Cuba. We have deepened our understanding of the challenges of development in an imperialist world, and of the political economy of socialist transition under such circumstances. As the measures of expediency taken in the Special Period helped economic recovery, Cuba entered a period known as the Battle of Ideas, around the early 2000s, spearheaded by Fidel Castro. Developed over a period of exceptional economic growth (starting from an extremely low base) and based on the extension of social provision, the Battle of Ideas was impressive both in scope and in the way it showed a socialist society prioritising social wellbeing. The campaign was closely directed by Fidel Castro and a circle of younger leaders in a way which bypassed bureaucratic administrative institutions, bringing immediate solutions to some problems. In 2006, Cuba launched the Energy Revolution, a major state initiative to save and rationalise the use of energy resources: to install efficient new power generators, experiment with renewable energy, and replace old durable goods with energy saving equipment. The Battle of Ideas had begun to address some of the negative socio-economic effects of the Special Period when the global crisis hit, exacerbating serious economic imbalances: massive dependence on food imports while millions of hectares of land lay idle, and while international food prices soared; full employment with disastrously low productivity; a highly-skilled but low paid workforce with little high-tech industry outside the biotechnology sector; huge foreign debt with low export earnings and restricted access to hard currency because of the US blockade. The need to restructure the Cuban economy was indisputable. The balance of payments and fiscal deficit were serious and without action, Cuba, a highly trade-dependent country, would have lost access to international markets and trading partners. Cuba had defaulted on millions of dollars of debt repayments. This was problematic because Cuba needs foreign capital to invest in the economy, to recover from the Special Period. Cuba no longer had access to cheap credit or beneficial trade deals from the socialist countries. This sort of exchange began gradually with Venezuela, starting from the cooperation accords of 2000, but even now remains limited compared to the assistance formerly received within the socialist bloc framework. Cuba’s choices are constrained because it operates within a capitalist global economy. The global capitalist crisis from 2008, and subsequently lower growth, exacerbated existing imbalances, leading to economic deterioration with a balance of payments and fiscal crisis. Fidel Castro’s health deteriorated and he retired, replaced by Raul Castro who was elected President of the Council of State in 2008. Raul Castro set out to introduce the structural changes necessary to address Cuba’s economic imbalances, to rationalise the use of resources, increase productivity and improve institutional efficiency and responsibility at every level. The process of restructuring the Cuban economy continued and deepened with the introduction of the ‘guidelines for economic and social policy’ approved in Congress in 2011. These guidelines for ‘updating Cuban socialism’ were the result of an unprecedented exercise in democracy – in which every Cuban was invited to contribute towards the debate about what should be changed and how. Of a population of 11.2 million, nine million Cubans joined debates about the draft guidelines, making three million suggestions resulting in amendments to 68% of the guidelines document (see FRFI 221). Subsequently, the spheres in which market mechanisms are permitted to operate have expanded (into agriculture production, housing, consumer goods, non-strategic production and commercial activity). These measures are explained in terms of expediency, with a candid assessment of Cuba’s economic weaknesses and vulnerabilities. They are not dressed up as virtues or progress or labelled as ‘Cuban-style socialism’. The introduction of market mechanisms is isolated to areas of production, distribution and consumption which are peripheral or non-strategic. Market mechanisms are excluded from Cuba’s socialist welfare (education and health care) sectors. While the role assigned to international capital in Cuba’s development strategy has also grown, the state retains monopoly control of strategic economic areas: nickel, sugar, biotechnology, finance and banking, and international trade. Rescinding socialism was never on the cards. The commitment to socialism remains non-negotiable. Cuba’s leadership has reiterated that socialism does not mean that the state should provide everything for each individual irrespective of their contribution to society. Productivity and efficiency must be inherent aspects of socialism and, as Che Guevara stated, ‘work is a social duty’. Clearly, however, there is debate within Cuba in which some ‘economists’ are essentially arguing for ‘market socialism’. They do not have policy-making power and are countered by others committed to controlling the operation of market mechanisms with state ownership and national planning. The kind of structural changes introduced could not have been undertaken if there were political instability, or if the Revolution lacked support or were vulnerable. This process has now dovetailed with the restoration of diplomatic relations with the United States. As a result, many of Cuba’s ‘friends’ are concerned that the path taken will inevitably lead to the restoration of capitalism in a more or less gradual process. Many of Cuba’s enemies – not least the Obama administration – eagerly anticipate the same. But Cubans have long memories of their oppression under, and resistance to, colonialism and imperialism. There is no danger of them being bewitched by rapprochement with the US. The restoration of diplomatic relations is a victory for Cuba. It is true that all the aggression was from the US side, but the US has had to make numerous concessions and changes to its approach, whereas Cuba has taken no measures in order to satisfy US demands. A direct result of talks between the US and Cuba was the release from US prisons of the remaining three members of the Cuban Five. That was an unexpected triumph for Cuba. RATB is proud to have made an early, active and consistent contribution to the international campaign demanding their freedom. The US does not have ‘normal’ relations with any country in the world. That aside, the preconditions which Cuba has set for ‘normalisation’ – the end of the US blockade, the return of Guantanamo Bay, the end to US ‘regime change’ programmes - are unlikely to be met in the near future. The US will continue to actively promote, and invest millions of dollars in, regime change. Cuba will continue to denounce and defend itself against these attacks. Cuba’s revolutionary leadership is working to strengthen Cuban institutions. This is necessary to ensure that the socialist system will outlive the original leaders of the Revolution: those who took it down a socialist path and who have won the trust of the Cuban population. Three generations of younger leaders are clearly identifiable from the grassroots to the national level – but the top leadership still guides the Revolution. Cuba remains a socialist country and RATB’s solidarity work will continue to uphold it as a living example of an alternative to the brutality of capitalism and austerity. We will continue to oppose the illegal US blockade, to demand the end of the illegal US occupation of Guantanamo Bay and to support Cuba’s right to self-determination. Over two decades of campaigning RATB has faced sectarianism and sabotage from the Executive Committee of the Cuba Solidarity Campaign (CSC) which depoliticises solidarity with Cuba: opposing the US blockade from a humanitarian perspective in order to appeal to the labour and trade union movement and corporate interests in Britain who do not support socialism. On the contrary, RATB expresses the solidarity of socialists, inspired by Cuba’s example who use it to argue for a socialist movement in Britain. Furthermore, the well-paid officers of the CSC’s Executive Committee assert a monopoly over solidarity work with Cuba and consider other groups or individuals relating to Cuba as ‘competition’. They have attempted to sabotage our work, forcing their own local branches to stop collaborating with us and pressuring speakers to pull out of our events. See 'Cuba Solidarity Campaign: the dead hand of sectarianism' on our website for one example. RATB is among several groups and individuals treated in this way. RATB has also confronted the British left which is dominated by ‘socialists’ who don’t support Cuba. Groups like the Socialist Workers' Party claim to oppose imperialist aggression towards Cuba while calling on the Cuban people to overthrow their government. They rewrite the history of the Revolution to justify their opposition. RATB has exposed their dogmatic sloganeering, in public meetings, articles and leaflets, to combat their influence which holds back the development of the movement for socialism in Britain.